Author ManshuPosted on November 29, 2010 November 29, 2010 Categories Thrift18 Comments on New Poll: What percentage of your monthly income do you save? What is the significance of Pre-open session of the stock exchanges we see from 9 am to 9.15 am daily? This is the first post based on the Suggest A Topic page that I created recently, and the title of the post is exactly what was written in the comment. I’ve created that page to get suggestions on topics from readers, and have them organized at one place instead of the usual emails and comments I get. This way is better for me to keep track of the post suggestions as they don’t get buried in my email, and its better for the person suggesting it because the suggestion is out where everyone can see it. So, to me it is a win – win. What is the Pre – Open Call Auction Session? The NSE and BSE introduced the pre – open call auction (pdf) sessions from October 18 2010, and these sessions are intended to reduce volatility and provide better liquidity in the markets. First 8 minutes: In the first 8 minutes orders are placed. They can be canceled or modified during this time period also. Next 4 minutes: In the next 4 minutes price discovery will be done, and orders will be executed. Next 3 minutes: The next 3 minutes are used to facilitate the transition from pre – open to regular session. Right now, only the index stocks are included in this session, and you can place both market, and limit orders as part of the pre – open session. A price band of 20% is applicable on all securities in the pre – open session. 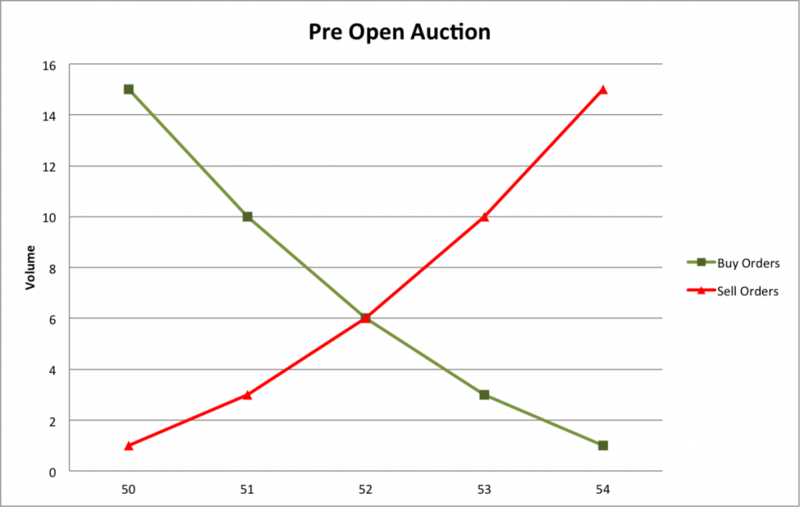 How does the Pre-Open Call Auction Session Work? The way they go about doing this is instead of executing trades right from the get go, they take all orders, and then arrive at an equilibrium price. The equilibrium price is the price at which the maximum number of shares can be traded based on the demand and supply quantity and the price. In this example you can see various buy and sell orders at different price levels. The green side is the buy side which shows that there is a bid for 5 shares at Rs. 50, 4 shares at Rs. 51, and so on till Rs. 54 at which there is just demand for 1 share. On the red side you can see that you can sell 5 shares at Rs. 54, but only 4 at Rs. 53, 3 at Rs. 52 and so on. There is a cumulative column at the end of both sides which shows you the total number of shares that can be bought or sold at any given price. If you were to create a demand – supply curve based on the price and cumulative values, it would look like this. The intersection of this curve is the price at which you can conduct the maximum transactions, and that’s the equilibrium price that comes out from this pre-open call auction. At Rs. 50 there are 15 buyers but just one seller so only 1 share will be traded. At Rs. 51 there are 10 buyers but only 3 sellers, so only 3 shares will be traded. At Rs. 52 there are 6 buyers and sellers so 6 shares will be traded. At Rs. 53 there are 10 sellers but only 3 buyers. And at Rs. 54 there are 15 sellers but only 1 buyer. So, in our example at the end of the price discovery phase the price will be determined at Rs. 52, and the orders that can be executed at that price will be executed. The other orders can be carried forward to trade in the regular market. In this example, if the normal method of determining price would have been used then some trades would have happened on Rs. 54, and Rs. 53 in our example, and by determining the price at an auction like this at least theoretically the exchange is smoothing out some of the volatility that occurs in the opening moments of the market. If there are more than two prices at which the demand supply matches then they see which of them has the minimum imbalance, and use that as the price. If both the prices create equal imbalance, then they look at the price which is closest to the last closing price and make that the equilibrium price. What is its significance on the market? You will hear a lot of folks say that the exchanges have implemented this change, which takes away from the fact that this was something that SEBI had asked the exchanges to look into, and implement, and is used in other countries as well. I guess until we see a day with a lot of volatility and the market opening with a big gap, and then that day is studied for impact from this change we will not know for sure how this is working, but in theory this sounds like a better system than the one we had earlier. For retail investors – it is always a good idea to place a limit order instead of a market order so that if the market moves violently you don’t lose out any money, especially in a one off black swan type of event. You could just keep a limit order close to the currently traded price or closing price if you don’t want to wait for your transaction to go through, but developing this habit will hold you in good stead in the long run. Also, there is some excellent material and a great video by BSE on this topic, and those of you who want to explore further can check them out. All the details for this post has been gathered from that material itself. Author ManshuPosted on November 29, 2010 November 26, 2010 Categories Investments19 Comments on What is the significance of Pre-open session of the stock exchanges we see from 9 am to 9.15 am daily?